Japan fears massive jellyfish invasion this year – from the fcking MOON. Space Jellyfish attacking? Marine surveys conducted in late June have revealed alarming numbers of Nomura’s jellyfish — massive creatures that grow up to 2 meters (6 ft 7 in) in diameter and weigh as much as to 220 kilograms (about 450 lbs) — lurking in the Yellow Sea and East China Sea. The researchers warn that ocean currents may bring swarms of the monster jellies to Japan,which has been plagued by similar invasions in recent years. Based on what they have seen so far, the researchers warn this year’s onslaught of Nomura’s jellyfish (Nemopilema nomurai, or Echizen kurage in Japanese) could deliver a massive blow to Japan’s fishing industry, rivaling even the devastating 2005 deluge that caused tens of billions of yen (hundreds of millions of dollars) in damage nationwide. The surveys are being conducted by a team led by Shinichi Ue, a professor of biological oceanography at Hiroshima University who also chairs a government research committee tasked with developing technology to predict and control jellyfish explosions. Ue has been monitoring the population density of Nomura’s jellyfish in the southern Yellow Sea and northern East China Sea since 2006. Between June 20 and 24, 2009, Ue’s team observed numerous specimens with umbrellas measuring 10 to 50 centimeters across, and they calculated an average distribution of 2.14 jellyfish per 100 square meters. 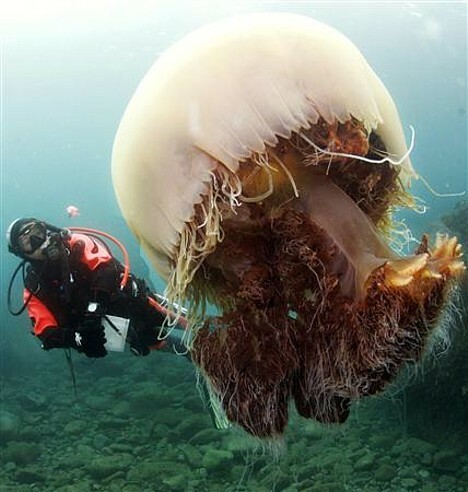 This figure is more than 200 times higher than the 0.01 jellyfish per 100 square meters observed in the same region in 2008. It is also nearly triple the 0.77 jellyfish per 100 square meters observed in 2007, when the fishing industry in the Sea of Japan suffered widespread damage. To make matters worse, this year’s swarms appear to be taking a more direct and southerly route to Japan, unlike in 2007 when the jellyfish appeared to take a more northerly route, approaching the Sea of Japan coast from the direction of Korea. According to the researchers, the ocean currents could bring unprecedented numbers of Nomura’s jellyfish to Japan’s Pacific coast, which typically sees far fewer of the monster blobs than the Sea of Japan coast. Nomura’s jellyfish typically bloom in Chinese waters in spring, and they mature into adults as ocean currents slowly carry them north. By July, when the first swarms reach Tsushima (just north of the southern island of Kyushu), many jellyfish are as large as sumo wrestlers. At this size, it only takes about 5 or 10 of them to destroy a commercial fishing net. 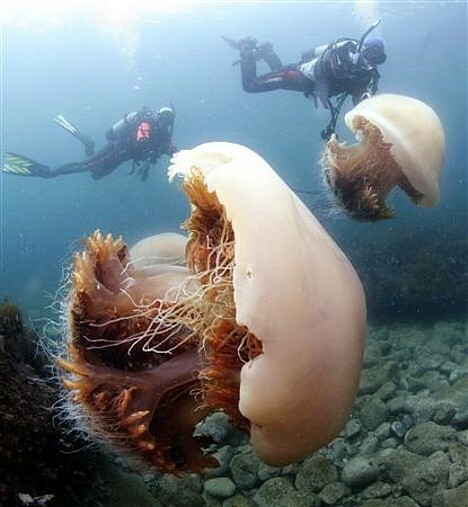 via Japan fears massive jellyfish invasion this year ::: Pink Tentacle. Next PostNext Independence Golf – This chick can swing at my balls anytime she wants.